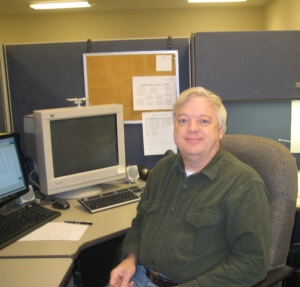 Rich Gray: Rich is a senior software engineer who started working with Digital Controls Corporation (DCC), our predecessor company, in 1983 as an embedded software programmer. He worked on products supporting NCR communication protocols in banking and government settings. At the time, he was using FORTH, a small programming environment originally developed for control of telescopes. One of the products, a front end communication processor interface for NCR’s VRX financial systems was driving roughly a quarter of the ATMs and teller terminals in the MIami, FL area through code Rich wrote. When Ivan Software (originators of LP Plus – OM Plus’s predecessor), became part of DCC, Rich began doing development on both ends of the communications interfaces between Ivan’s software and DCC’s hardware. Over time, he became increasingly involved in LP Plus development, eventually becoming a full time member of the team which was to become Plus Technologies. His current responsibilities include work on OM Plus Delivery Manager (DM), particularly its printer communication protocols, as well as key projects including SAP BC-XOM solutions and data collecting for Fleet Manager (FM) and Stats Manager (SM).